100% cotton, quality t-shirt (shirt Made in India) with quilting cotton applique in an original design. I have designed this for FeltAid, it is not available anywhere else and is one-of-a-kind. I spent childhood holidays in Christchurch with my grandparents and have many memories of the city, but will always remember the amazing 'Chch' buildings being framed by gardens and flowers, so I have chosen some of my favourite floral prints. A great baby shower or newborn gift for a family with a Christchurch connection. Topography shirts look very cute framed or on a teddy bear after baby has grown out of them. 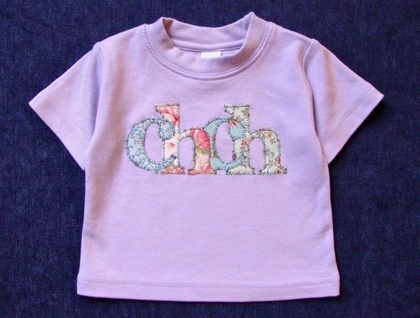 Hand-cut applique is fused and machine-sewn on, and the inside of the shirt is lined to stop the stitching from rubbing on baby's skin. Shirt is pre-washed to minimize shrinkage.